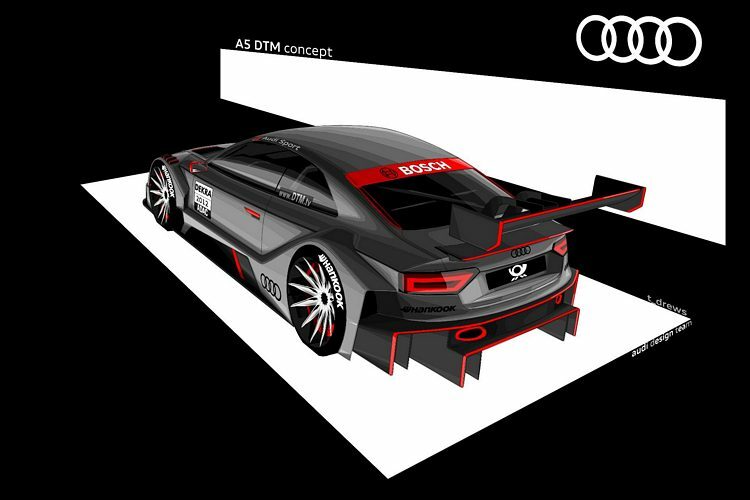 Ingolstadt, September 11, 2011 – Audi is making a clear commitment to its newest motorsport project with a world premiere at the Frankfurt International Motor Show: At the 64th IAA the new DTM race car of the brand for the 2012 season will be unveiled to the public. Debut in Frankfurt: Before the official opening of the IAA the new Audi A5 DTM will be presented to members of the media from all over the world on Monday evening. From Tuesday onward, it will be showcased throughout the motor show. The race car bearing the internal designation “R17” succeeds the A4 DTM that has been used since 2004. The new A5 DTM rings in a new era starting in 2012: The DTM, Europe’s most popular touring car series, is shining with the passive safety of its vehicles which has been clearly enhanced yet again. At the same time, the costs are going down. Grand stage for the Audi driver squad: Eight Audi DTM drivers will be on hand to sign autographs and give interviews at the IAA, at Audi and partner locations as well as on the ARD stage: Filipe Albuquerque, Rahel Frey, Miguel Molina, Edoardo Mortara, Oliver Jarvis, Mike Rockenfeller, Timo Scheider and leader of the standings Martin Tomczyk will be in Frankfurt on different days between September 19 and 25. On Tuesday the Le Mans winners Marcel Fässler, André Lotterer and Benoît Tréluyer will be attending the Audi press conference. R18 TDI meets R8C: A meeting of two vehicle generations took place as part of the ILMC race programme at Silverstone. Audi had organized a photo shoot of the Audi R8C from 1999 and the current Audi R18 TDI . The R8C was Audi’s first closed-wheel Le Mans prototype. After nine triumphs with open-wheel vehicles the brand with the four rings celebrated the first Le Mans victory with a coupe in 2011 – twelve years after the R8C’s debut. Both prototypes were also showcased in the Audi Fan Area at Silverstone. Team spirit: Dindo Capello, Marco Bonanomi, Romain Dumas and Mike Rockenfeller visited their team-mates from Le Mans at the ILMC race at Silverstone. DTM driver Oliver Jarvis kept his fingers crossed for Audi Sport Team Joest as well. “Vorsprung durch Technik” made visible: Audi has published a photo of the carbon monocoque of the Le Mans winning R18 TDI. Thanks to a new manufacturing process developed by Audi the cell of the LMP1 sports car features a one-piece design which makes it extremely sturdy while minimizing weight. Carbon will play an increasingly important role in the development of production vehicles as well. The Audi urban concept to be presented at the IAA also has a monocoque made of carbon fiber reinforced plastic (CFRP). Worth their weight in gold: Mattias Ekström is serving on the 2011 panel of judges for the “Golden Steering Wheel.” The Audi factory is thus a member of the group of experts who test and evaluate the latest generation of automobiles. The publishing house Axel-Springer-Verlag has been awarding the “Golden Steering Wheel” for the best new car launches since 1976. The awards will be presented in Berlin on November 9. 24 hours of karting fun: Audi factory driver Rahel Frey contested the Berlin 24 Hours last weekend. Together with Miriam Hofbauer, Andrina Gugger, Isabella Lauer and Lisa Gruber the Swiss competed for the Speedladies kart team. Despite an early technical defect and the resulting loss of several laps the quick ladies achieved 9th place and set the third-fastest race lap. Overall victory went to a crew of mechanics from Audi Sport Team Phoenix, Rahel Frey’s race team in the DTM. Stars at the controls: Alongside the DTM at Oschersleben the “Audi DTM Challenge” – a round of the rallye racing Carrera Cup slot car racing series – will be held on Saturday night. The DTM drivers Mattias Ekström, Rahel Frey, Miguel Molina, Mike Rockenfeller and Martin Tomczyk will compete in the event as well. Presence in Leuna: Audi factory driver Martin Tomczyk will be on hand to talk with invited members of the media next Thursday at a press conference about the race at Oschersleben. The leader of the standings will be answering the journalists’ questions at the “nova eventis” shopping and event world in Leuna starting at 11 a.m. It wins and wins and wins: The Audi R8 , with a track record of 63 triumphs the most successful LMP1 cars of all time, celebrated another victory last weekend at the U.S. Vintage Grand Prix at Watkins Glen (USA). At Silverstone you had the opportunity to witness an ILMC race as a spectator for a change. What were your impressions? This wasn’t a completely new experience for me. I once watched the race at Road Atlanta as a reserve driver. It’s always nice to be at a race track. I love motorsport even when I’m not driving myself. Of course I prefer sitting in the car. But it’s also good to keep your fingers crossed for the guys for a change and to be part of the team. It’s also very special for me because I hadn’t seen many of them since Le Mans. I was happy to meet all of them again. And it was nice that the mechanics were pleased to see me go to the pits during the race. Le Mans was a very emotional experience for me – this year unfortunately it was a negative one and not as positive as after the victory in 2010. So that made it good to come back here again. And the sports car races are simply great. It’s also fun watching it from the pits. How do you assess the race? It was obvious that the Audi R18 TDI was very strong and on an equal footing with the competition. But you could also see that you’ve got to have the perfect race if you want to have a chance of victory. The battle at the front of the field is incredibly close. You can’t afford the slightest mistake and also need a bit of luck. Audi unfortunately didn’t have that at Silverstone. You’ll be racing again next week in the DTM at Oschersleben. With what expectations will you be traveling to that event? The aim, clearly, is to win the race. I really like the track. I was running well there even in Formula König and in the Porsche Carrera Cup and did some tests at Oschersleben in my early days as a racer. The track is challenging and suits me pretty well. That’s why I’m particularly looking forward to it. I’m hoping for us to achieve a good set-up again in order to make it onto the two front rows as I last did at Brands Hatch.